When it comes to searching for the best Android tablet, there are fewer options compared to a few years ago where Google's operating system was popping up on slates from almost every major manufacturer. The tablet market slowed down since, and those still producing Android tablets have reduced the frequency of launches, but that means quality has improved as new devices are no longer being rushed out. 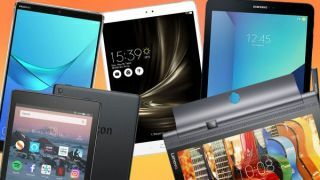 While the selection of new Android tablets isn't as large as it once was, and nowhere near as large as the selection of Android phones, there's still some great ones to choose from. Android is one of the main rivals to Apple's tablet range which includes the new iPad Pro 11 (2018), iPad Pro 12.9 (2018) and iPad (2018). Some Android tablets have 10-inch screens, others seven, some land somewhere in between and a handful even push the boundaries past 10 inches. There are also big differences in battery life, processing power, RAM and even the software each slate is running. And even once you know what specs you're after there are plenty of not so great options, so to help you avoid buying a dud we've put together this list of the best Android tablets around. They cover a range of options and we've included a rundown of the specs, the pros and the cons, so you can see at a glance what's right for you. However, if none of these taking your fancy you can always look towards new tablet launches in 2019. Amazon is likely to give its Fire tablet range another reboot, Samsung will continue to try and provide an Android answer to the iPad and a few surprising launches for other firms could spice up our best Android tablets list in the next 12 months. The Samsung Galaxy Tab S4 is the best Android tablet available right now. It's not exactly cheap, but it comes packing a whole hosts of features to ensure you're getting plenty of bang for your buck. Unlike Apple's iPad Pro range, the Galaxy Tab S4 comes with Samsung's S Pen stylus included in the box, while under the hood you get the powerful Snapdragon 835 chipset alongside 6GB of RAM ensuring Android runs super-smoothly on screen. That's only half the story though. Pair the Samsung Galaxy Tab S4 with a keyboard and mouse and it'll transfer from Android into a desktop-like experience as it attempts to replace your laptop as well as your tablet. The desktop aspect of the tablet is limited for the time being, but we fully expect it to improve with future software updates. In short, the Galaxy Tab S4 is the most versatile Android tablet around. Samsung's Galaxy Tab S3 is our favorite Android tablet in the world right now. This tablet is the second best Android slate in the world thanks to a powerful processor and an excellent display that's prepped to show you HDR content. There's an S-Pen stylus in the box and you'll also have the option of buying a keyboard too, but that will cost quite a bit extra. The price of the Galaxy Tab S3 is high, but it's worth it when you look at all of the power and amazing features you'll get for that amount of money. Nope, that's not an iPad you can see just above. That's the Asus ZenPad 3S 10 - and it's our third favourite Android tablet you're able to buy right now. There's decent power inside this slate as well as a super bright and beautiful display to look at on the front. The battery life and build quality aren't the best on the market, but considering the lower price point than the Samsung Galaxy Tab S4 and Tab S3 above, we'd recommend picking this up if you're looking for something a touch cheaper. The Amazon Fire HD 8 (2017) is among the best of the retail giant’s tablets, as while it’s in many ways lower end than the similar HD 10, the smaller screen is sharper as a result, and the price is lower. It also delivers surprisingly strong gaming performance, with a decent amount of power for the money. The speakers aren’t great and the cameras are awful, but tablets aren’t for taking photos and you can always use headphones. What you do get is solid if not spectacular performance, and tight integration with Amazon’s other services through Fire OS, all at a price that’s well below most of the non-Amazon branded competition. You should also note that if you already own the 2016 version of this tablet, it won't be worth upgrading to the 2017 version as the differences are very minimal. The Lenovo Yoga Tab 3 Pro is packed full of media-focused features and sports a unique, distinctive design. There's a built in stand to take the heft off your hands, while the integrated projector means you can enjoy big screen entertainment away from your TV, though the screen is sharp enough that you won't always feel the need to use a projector anyway. All that tech does make it less portable than most tablets on this list and the UI could be better, but it's a fairly unique option.